I’ve been trying to craft a manifesto. I’ve not been able to muster the words beyond a few blog posts here and there. But I will wait for it. It will come. I know that the mind curtains will lift and I probably just need to begin. God hopes we will realize that we are but a small (but hugely significant) part of creation. And that this knowledge will make a lighter burden this year. I feel like this year will be lighter than last because of this knowledge. That the whole world and all of it’s going on doesn’t depend on me. I did uncover a writing–a manifesto of sorts, written before manifestos were a thing. It fits because this year I’m going to try to do something that seems even more impossible now that I realize how bad I am at trying to coordinate phone calls over multiple time zones. Regardless, I’m going to try. I’m trying to change the stories that shouldn’t be through youth ministries who will hold hands around the globe to create a path of advocacy that will interrupt the cycles of poverty and oppression in our world. I have no idea if it’s going to work. But I’m willing to give the rest of my human life trying. You’ll be hearing a lot about it in 2015. So, whatever it is you’re trying to do. Even if it never happens in your lifetime, remember that your part is a significant one. The Pacific Crest Trail was thought of someone named Catherine Montgomery. The Pacific Crest Trail spans 2,650 miles (4,265 kilometers) from Mexico to Canada through California, Oregon, and Washington. Her vision led Clinton Churchill Clark to begin dreaming up a trail. She nor he ever got to see ANY OF IT happen but he was able to make an acquaintance with Warren Rogers who mobilized YMCA volunteers to chart and construct portions of the trail. No one who originally imagined the lasting “curative and civilizing value” of the trail lived to see it’s completion. But how would it be without them? 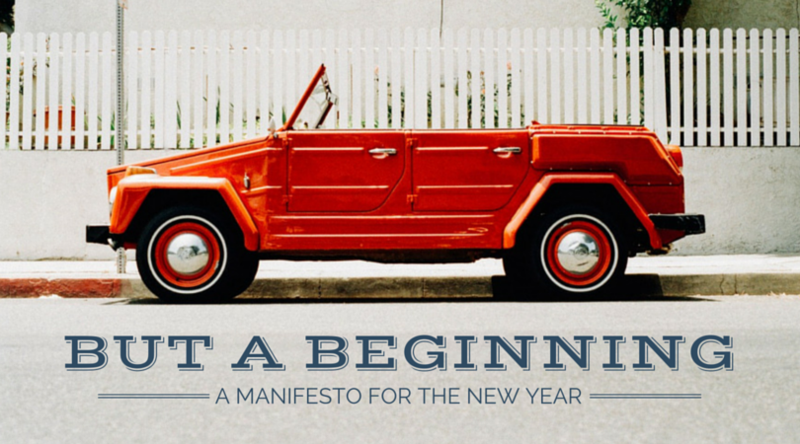 Consider this manifesto as you start the new year. It doesn’t have a name that I know of. So I’ll name it something I can remember. Let’s call it, “But It Is A Beginning”. I’ll be printing it and praying it, for the next 365. I invite you to join me. Ministers, not messiahs. We are prophets of a future that is not our own.